As proponents continue to tout the benefits of banning plastic bags, the debate over whether Texas cities like Austin actually have the ability to enact such ordinances has made its way to the attorney general’s office. In a letter seeking an opinion from Attorney General Greg Abbott, state Rep. Dan Flynn, R-Canton, questioned whether the city bans are in compliance with the state’s health and safety laws. The letter, which was received last week by the attorney general’s office, asks the office to interpret a specific section of the Texas Health and Safety Code. The section states that a municipal district may not pass legislative restrictions or charge fees relating to the consumption of a “container or package” for waste management purposes. “I can’t begin to tell you how many phone calls we received about the legality of the bans,” said Flynn, whose district does not have any communities that have imposed bag bans. Even though it doesn’t affect him directly, “there are a lot of people who are really inconvenienced by it,” he said. One of the most vocal opponents of bag bans, the Texas Retailers Association, approached Flynn about writing the letter to the attorney general’s office. The push for an opinion from the attorney general’s office comes a year after the retailers group filed a lawsuit targeting Austin’s plastic bag ban last February. 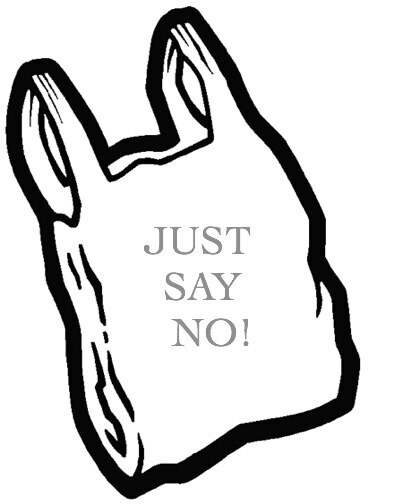 But the group dropped the lawsuit after Austin officials asked it to disclose information on the sales of plastic bags. A copy of that now-dropped lawsuit is here. Rep. Flynn’s letter basically recapitulates its arguments. I assume that the cities that have adopted these bans have attorneys at their disposal who can interpret state law and advise their clients how likely they are to get their posteriors handed to them in court some day, so I presume there is a counterargument to be made here. If any lawyers would like to weigh in on that, I’d be delighted to hear it. Whether the timing of this request has anything to do with the developments in San Antonio or not I couldn’t say, but thanks to Rep. Flynn we can now say with confidence that it is possible to carry water in a plastic bag. for what it’s worth, it now seems odd to me to get a bag, and I often refuse them in other cities.